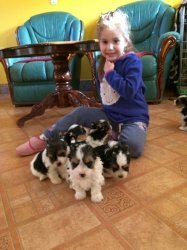 Gorgeous Biewer Yorkshire Terrier puppies which have been bred for temperament and beauty! The puppies have been dewormed, vet checked, microchipped and reared in an animal loving home with kids and other family pets. They have been well handled, loved, cuddled and socialized. Mum and Dad can be seen. They are KUSA Registered and will come with their Pedigree Papers, Vet Certificate, Puppy Pack, Contract, food samples, a toy and blanket with the scent of their mother.